Last year Rick Mercer unveiled the Disgraced Mayors Serving Set. It featured former London Mayor Joe Fontana, former Montreal Mayor Gerald Tremblay, former Laval Mayor Gilles Vaillancourt, and Toronto’s disgraced but still serving mayor, Rob Ford. At that time Mayor Sam Katz received only an honorable mention as a “soon to be disgraced mayor”. I think we should all contact Mr. Mercer and urge him to reconsider his rankings for the next, Disgraced Mayor Serving Set. We should demand that our mayor’s status be elevated from ‘soon to be disgraced’ to ‘disgraced’. I think he has earned it. Who will be the next Mini Me? The Ernst and Young audit report on the fire halls fiasco has finally seen the light of day. It doesn’t look pretty and it emanates a distinctly unpleasant odor, an odor of rot festering in the political and administrative bowels of power at City Hall. The report outlines a number of concerns that deal with administrative process and oversight but the most concerning issues identified (albeit process-related) strike at the very heart of the free enterprise system as well as citizen and business trust. The city is not in a position to perform much of the work on projects it finances and thus hires contractors to perform those tasks. That process of hiring such contractors must be fair and equitable and put all bidders on an equal footing. At the core of many municipal corruption scandals is the bypassing of such processes. Some bidders are given, or gain an unfair advantage by having access to confidential information not available to other bidders. According to the Ernst and Young report Shindico had such an advantage in the case at hand. In most cases where one party gains an unfair advantage they will realize an increase in profits and reciprocate with some form of quid pro quo. Usually, when what amounts to industrial intelligence flows one way, kickbacks flow the other way. The Charbonneau Commission in Quebec emphasizes that point. The Ernst and Young report does not suggest there were any kickbacks in the fire halls fiasco. Determination of whether there was any guid pro quo goes beyond the scope of an audit and would require an in-depth criminal investigation or a Commission of Inquiry. It would be highly unusual for any of the principals at the heart of an audit to come out and make a ‘mea culpa’ declaration. Power is the ability to influence the actions of others. An example of the exercise of power could be a municipal mayor (Sam) who, when selecting a CAO, prevailing on the other members of the selection committee (EPC) to select the candidate of his choice. In such an instance the mayor does not have the authority to order members of EPC to take a particular position, but he, none the less has power as he controls appointments to the committee. Authority is the legal right to act. In the case at hand the CAO is given legal authority to undertake a wide variety of actions on behalf of the City under guidelines laid down by Council. When Phil Sheegle was appointed CAO the Mayor bristled at the suggestion he was not qualified to perform the function. The Ernst and Young report suggests the mayor’s detractors were spot on. As well the mayor would have us believe that he and the former CAO, although they are close friends do not have discussions about city related issues like the fire hall fiasco and the related land swaps. Do these two buddies look like they hold much back from each other? It is clear that when the mayor appoints a ‘mini me’ CAO there is a dangerous convergence of power and authority. It puts the mayor in the position wielding political power, as well as administrative authority by proxy. The mayor has already indicated that his choice to fill the CAO’s chair in an acting capacity is Deepak Joshi – yes the same Deepak Joshi named in the Ernst and Young Report. One would have hoped that the members of EPC would have learned from the last appointment that the mayor’s choice may not be the best choice. We cannot afford another mini me CAO. It’s time that Winnipegers wake up to the realization that Mayor Katz may actually have been truthful when he said that he was a businessman and not a politician. The problem may be that he views the City of Winnipeg as his business, his own little fiefdom, putting in place cronies to help him run ‘his business’. That begs the question, to whose benefit is the city being run, the citizens’ benefit or the mayor’s benefit? To a degree we are all responsible for what is happening at City Hall: we elected Sam Katz, not once but several times. It may be time for like-minded people to get together and initiate a movement under the banner “ANYONE BUT SAM” and clean up the mess at City Hall. Several years ago the Winnipeg Police Service (read Mayor Katz) decided that Winnipeg needed (read wanted) a helicopter. At that time I wrote a series of posts commenting on the decision-making process employed to determine whether the police service should acquire a helicopter, as well as the nuts and bolts of running a flight operations unit. The Winnipeg Police Service recently issued the 2012 Flight Operations Unit Annual Report. It is of some interest to note that the Flight Operations Unit is the only unit within the Police Service that issues an in-depth annual report, separate and apart from the normal Winnipeg Police Service Annual Report. Perhaps this is a forerunner of other unit annual reports to come. I’m being facetious of course. The only reason the Flight Operations Unit issues a stand alone annual report is to justify the initial capital and subsequent ongoing operational expenditures of the unit. The real purpose of the report is to demonstrate that the original decision to purchase a helicopter was a good one. Although I have not dissected the report in detail I have noticed a number of interesting points. When the helicopter idea was being ‘sold’ to the public, politicians and police officials talked about the helicopter being in the air 4 to 5 hours a day. The 2012 reports shows 2.7 hours of flight time per day. One of the primary reasons originally cited for acquiring a helicopter, was to deal with Winnipeg’s ongoing problem of auto theft. A helicopter it was argued would be very beneficial in terms of discouraging auto theft and, in cases where cars had been stolen, tracking stolen vehicles on the road and assisting in the arrest of auto thieves. In a previous post I argued that if the Police Service operated a helicopter it would only be available to assist in approximately 12% of stolen car chases. At the time, some questioned my calculations and subsequent estimate. Turns out I did indeed miscalculated…. by 2%. In 2012 the police helicopter was available to assist in a total of 5 pursuits which works out to just under 14% of the total number of car chases that took place. 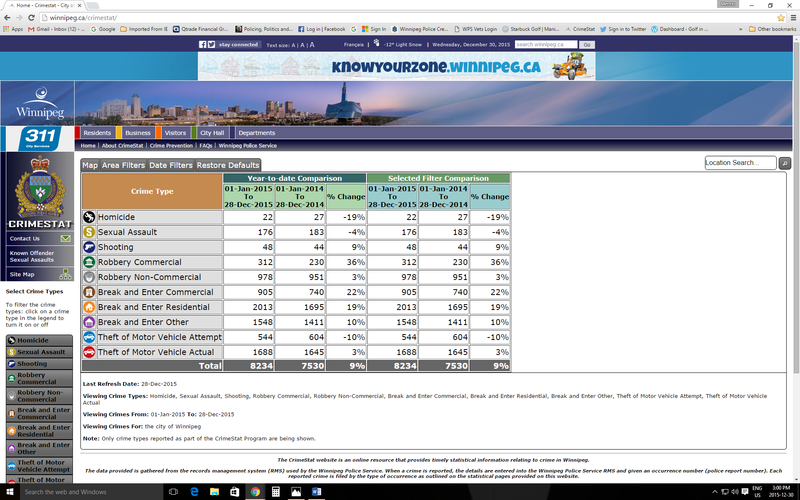 And what happened to the promise in terms of the positive effect a helicopter would have on auto theft rates in Winnipeg? In the last 12 months auto theft has gone up 10%, this during a period that the Flight Operations Unit was up and running. This comes on the heels of many years of double-digit declines thanks to the Auto Theft strategy. And things are not looking better for 2013. Although the numbers are still small this early in the year, the rate of auto theft in Winnipeg climbed 23% so far this year when compared to the same period last year. Contrast that with the cost and the results generated by the Warrant Apprehension Unit. They also get bad guys off the street – not by ‘assisting’ or being in the vicinity but by actually going out into the street, and doing investigations and apprehensions. The cost of that unit is in the range of $ .8 million and with an arrest rate of approximately 800 per year, the cost per arrest is in the range of $1000.00, a far cry from $9300.00. Were an additional $1,727,590.00 allocated to the Warrant Apprehension Unit at $1000.00 a head they could have arrested an additional 1700 criminals. That would be a somewhat better return on the dollar than the 285 arrests the Flight Operations Unit ‘assisted’ with. * I’m not suggesting that the number of arrests should be the only criteria used to measure the performance of the Unit. However, based on the fact that all but one of the anecdotal examples of Unit activities cited in the report involve arrests, it is obvious that the Winnipeg Police Service sees this as one of the primary, if not the prime function of the Unit.